At first glance, Vegas Casino Online looks very much like the many new casinos that crop up on the internet every day of the week. Graphics are sub-par and there isn't anything that immediately makes me think “I want to play here!” However, the old adage teaches that one should never judge a book by a cover, so I poked around the site and read all the info they presented. Sign up procedure was painless and download was very fast. This is because you only download the basic program, with no games. Afterwards you load each game on individually as you need it. So if you only ever play blackjack, then you only have to download one game! This is a smart way of doing things. The games themselves were not pretty compared to many other casinos, and the voice of the dealer was downright annoying, but credit where credit is due – the games played well and the odds seemed as fair as any land-based casino I have played in Vegas. Thus, I trust their honesty. 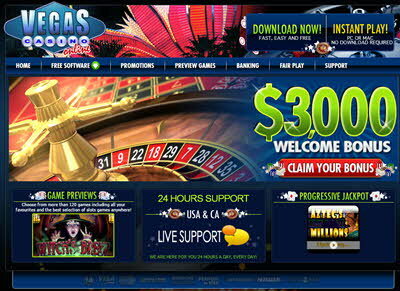 This is a big stumbling block for many casinos, but VegasUSA gained my trust early on. Before I spent any real money, I wanted to talk to customer support about the blackjack rules they were using. Unfortunately, they have no customer support phone number so I had to email them, and it took 3 hours to get a response time. This is not a terrible response time, but a phone number would have gotten me instant results. The Casino manager assures me that three hours is well above the average response time, and I think he roasted his customer support reps for leaving me for three hours. In terms of making purchases, you have to do it by credit card. If you want to open account another way you should look elsewhere. When I had played for a little while I came out $100 up after a good run on the blackjack table and decided to cash out and see how their payment process worked. This was the most impressive part of VegasUSA for me. My payment was in my mailbox within 5 days! They work on a basis of crediting your credit card with your initial deposit and sending you only your winnings by mail. This is a big bonus for many people as it cuts down on credit card transactions. I liked this feature. Overall I am fairly impressed, if not dazzled. I have my $100 in winnings and it didn't take a fight to get it! I would love a customer support phone line so that I can get answers quickly, or maybe online chat support so that phone users don't have to hang up their connection. I hate having to wait for answers to my queries, even if it is only three hours! The commitment to customers is above average and odds are fair.